THE MANUAL VOL. 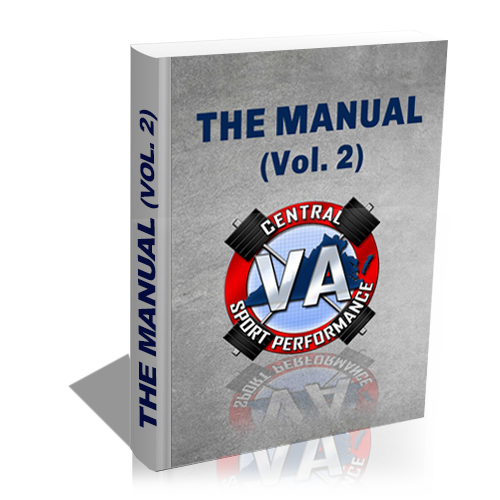 2, is the second publication from Central Virginia Sport Performance. In THE MANUAL VOL. 2, you will find ten chapters from ten individuals who have had an immense impact on everything we have done and will continue to do here at Central Virginia Sport Performance. As with all of our content, we are hopeful that this book will provide useful and applicable informant to not only assist the readers in helping their athletes perform better, but also drive better conversations between practitioners . Whether that is through vision training (Chpt.10), agility training (Chpt. 4), or even looking at the aerobic system (Chpt. 7) we hope that at least one of these chapters can assist the great coaches who have been involved with CVASP in helping their athletes reach their goals..
Quick and concise chapters that are easy to read. 191 pages of practical considerations for strength and conditioning coaches to use immediately with their athletes. In-depth examples and personal experiences from each author that the reader can easily apply to their own situations no matter what level the coach or athlete. Brief bios for each author at the end of their respective chapter that describes the impact they have had on the strength and conditioning field. Chpt. 2 - Bob Aljeo: We Talk About It But Do We Teach It!?! ?